Life has moved on the fast lane …… do you remember your first encounter with the Computer …. Could have been AT 286 … the earlier days IBM Personal Computer AT, itself was second-generation PC, designed around the 6 MHz Intel 80286 microprocessor and released in 1984. The name AT stood for "Advanced Technology", and was chosen because the AT offered various technologies that were then new in personal computers; later it was to have 16 MB maximum memory, compared to the PC's 640 KB maximum. As all would know, the Central Processing Unit (CPU) is responsible for interpreting and executing most of the commands from the computer'shardware and software. The CPU attaches directly to a CPU socket on the motherboard located inside the computer. There is news from Israel that Inuitive Ltd ., a leading 3D Imaging and Computer Vision Processor developer, has sampled its NU3000 ASIC , the most advanced Image and Computer Vision (CV) Processor in the industry. Sure you would remember that dialogue in Rajni starrer ‘Enthiran’ - Dr. Vaseekaran (who else than Rajinikant), a scientist specialized in robotics, creates a sophisticated android robot which would say - Hi, I am Robot. Speed 1 Tera Hertz and Memory 1 Zetta Byte. Since its launch in 2001, Wikipedia has become the most popular general reference site on the internet. It contains more than 31million entries in 285 languages. At least 20,000 are health-related. The team, who looked at information on conditions such as diabetes, lung cancer and back pain, said: ‘Wikipedia’s prominence has been made possible by its fundamental design as a collaborative database. Errors on Wikipedia included an entry which stated that to correctly diagnose high blood pressure, high readings must be obtained on three separate occasions. The researchers said that is not true and could lead to a dangerous delay in treatment. Drug companies have also been accused of editing Wikipedia to remove references to harmful side effects. In 2009, employees at AstraZeneca allegedly deleted a sentence claiming that a treatment for manic depression made teenagers ‘more likely to think about harming or killing themselves.’ The study, published in the Journal of the American Osteopathic Association, backs up surveys showing as many as a quarter of women have misdiagnosed themselves on Google. Worker ants can process information far more efficiently than Google, a new study claims. The researchers found that while an individual ant that is hunting for food walks a random path, their collective foraging behaviour transforms from chaos into order. Together, they can process information efficiently to secure ample food to allow a colony to thrive. Woodland ants work together to fire smelly acid into the air to ward off predators. The group attack using formic acid to protect a nest is enough to scare off woodpeckers and jay birds. Fire ants bind together to build a life raft in order to survive floods. They use their claws and mandibles to grip each other and link together in a similar way to how waterproof fabric is woven. An individual ant’s exoskeleton is moderately hydrophobic so it can shrug off water, but the ants enhance their water repellence by linking their bodies together. Rock ants continually monitor the area near their nest in case they find a more suitable home, especially if there's is in a state of disrepair. Lead researcher Carolina Doran from Bristol University said: ‘This strategy of adjusting their information gathering according to their actual needs and the real value of higher rungs on the property ladder may help ants to evaluate their housing market in a measured and thorough way that puts many of us to shame.’ Nasa has send 800 common ants to live on the International Space Station to teach scientists how they move in low gravity. It is hoped that the eight colonies will give experts new ideas of how to build robots that interact with each other. Last week, a study from the Georgia Institute of Technology revealed that ants' skills at building stable underground tunnels in, loose sand could help engineers design the next generation of rescue robots. They used cameras to monitor the way fire ants use their antennae as extra limbs to stop themselves from falling. The mathematical study found that the creatures are capable of using problem-solving strategies and the move from chaos to order happens in a surprisingly efficient, self-organised way. Understanding the ants could help experts analyse similar phenomena such as how humans behave when using the internet or even lead to the development of smart transport systems. The Chinese-German research team expressed everything that is known about the foraging of ants in equations and algorithms and fed them into computers. 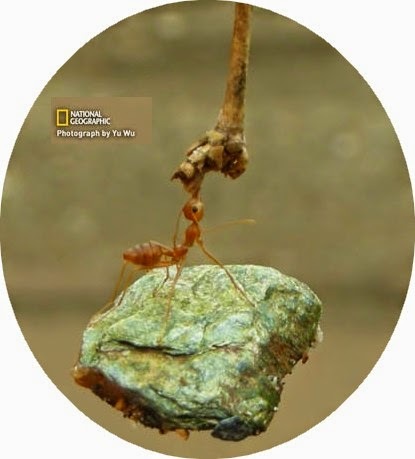 They found that ants use intelligent navigational strategies to divide themselves into ‘scouting’ and ‘gathering’ groups when searching for food. Confused ! – simple – follow the nature – or wait for the next research which could throw some other dimension….